As its last event of the year, Galerie m at Schlosspark Weitmar is putting on a group exhibition of works by the above-named artists. The show provides a small overview of the program of exhibits at the gallery in recent years, in which boundaries have often been transcended not only in the formal sense, but also in terms of content. Time and again, the non-representational art so characteristic for Galerie m during its 34 years of existence enters into an intriguing dialogue with representational art and photography – forming a springboard by which the exhibition program continues to evolve and expand. 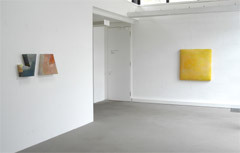 Artists associated with the gallery for several years now, such as Leon Polk Smith or Mary Heilmann with their “shaped canvases,” managed to break with the tradition of classic panel pictures and pictorial compositions, while the “color space bodies” of Gotthard Graubner, as well as the objects created by Elisabeth Vary, venture into three dimensionality, rendering the boundaries between picture, object, and space. 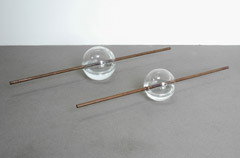 Alongside the aspect of space, time is also a crucial factor in the installations of Carla Guagliardi. Her extraordinary sensitivity to a wide variety of materials and their combinations is echoed as well in the works of Dounia Oualit. 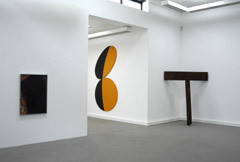 A connection with Concrete Art can be discerned in the works of Keiko Sadakane, François Perrodin, and Alfredo Álvarez Plágaro. While their art exhibited here is solidly grounded in a systematic, rational approach, it simultaneously takes up aspects of seriality and variability, coupling cool rationality with a sensually tangible materiality and painterliness. Andy Warhol’s concept of art not only calls into question the boundaries between ‘art’ and ‘commerce,’ but also demonstrates, for example in his “Electric Chairs” silkscreen series, that an art formally verging on the ‘commercial’ is not necessarily void of content and critical intent. These prints are juxtaposed with his lesser known “Piss Paintings,” which drive the question of which content is worthy of artistic representation to its logical extreme. 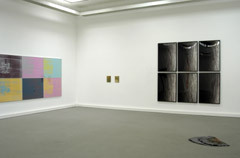 The fact that photography as independent medium is today an incontrovertible component of the art discourse, and is more than capable of standing its ground in terms of multiplicity of content and form, as well as a commanding presence, is amply demonstrated by the works of Thomas Florschuetz, Lucinda Devlin, Peter Hendricks and Wolfgang Bellwinkel.